Figure 1 Cretaceous uplifts and igneous features of the Gulf Coast (modified after Ewing, 2009). The study area of the iGoM project extends from northeast Mexico to Mississippi.The northern Gulf of Mexico basin arguably surpasses any region in the world in the quantity of geophysical data that has been acquired for petroleum exploration. However in this area that is so rich in data, the tectonic origin and evolution of the crust and crystalline basement (continental and oceanic), including major Cretaceous crustal structures and igneous activity, and their relationship to the thermal and structural evolution of the region, remain poorly understood. The tectonic origin of the Gulf of Mexico (GoM) can be broadly described as Triassic rifting followed by Jurassic seafloor spreading. However the nature of rifted Triassic crust, and the connection, if any, with early Central Atlantic opening requires further investigation. Regarding Jurassic seafloor spreading, alternate and conflicting theories for the timing, opening geometry, and extent of oceanic crust exist. An improved understanding of this process will significantly impact models describing: 1) the shape of attenuated continental blocks; 2) early salt and carbonate deposition; and 3) subsequent clastic sediment dispersal systems. During the Cretaceous, basinal events include onshore (and at least some offshore) igneous activity and rapid deepening of the GoM basin. 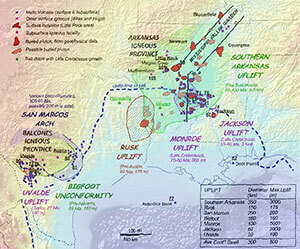 Igneous rocks are widespread and extend from the Uvalde and Balcones volcanic fields of Texas, through northern Louisiana and eastern Arkansas, to the Jackson Dome in Mississippi (Figure 1) (1). 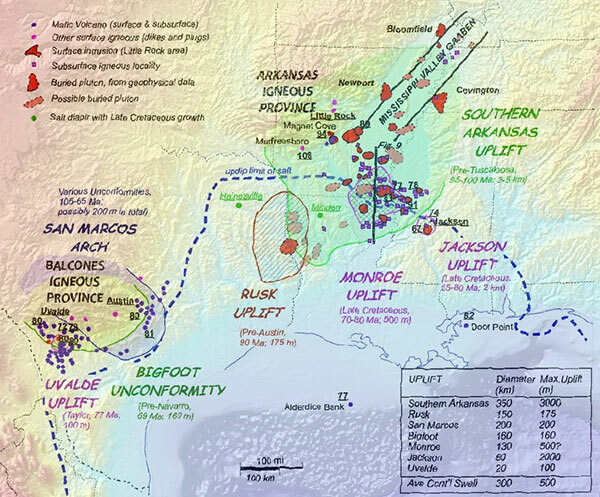 Their potential relationship with Cretaceous deformation and formation of the Uvalde, Rusk, Monroe and Jackson Uplifts, as well as the rapid deepening of the GoM basin during the Cretaceous, are at present poorly understood. Crustal uplifts of the onshore northern Gulf of Mexico (GoM) (~100-70 Ma, Figure 1) vary in size and age. Their development is associated with regional unconformities. The origin of these igneous and structural events is not well understood, and the debate includes a range of ideas including partial melting in the upper mantle, lower crust fractionation, mantle plume, edge-driven mantle convection, and far-field plate boundary effects(1). The overarching goal of the consortium is to understand the crustal evolution of the northern Gulf of Mexico Basin, onshore and offshore, and assess its effect on thermal history and present day basin morphology. To reach this goal it is critical to analyze igneous rocks, determine crystalline basement morphology and crustal thickness, and integrate geologic, well, seismic (reflection, refraction and earthquake), heat flow, gravity and magnetic data into geophysical models. These models, and the overall study, will include detailed analyses aimed at assessing how Triassic rifting, Jurassic seafloor spreading, and Cretaceous magmatism and deformation may be related.